Each morning I give thanks for a new day and commit to finding ways to be mendful, connected, helpful and kind. Disasters, difficulties and personal hardships are natural challenges of life. We come together in community and friendship and create safe space and rituals to lighten the load of pain and reduce suffering. To make meaning and bring comfort and solace to one another. We are reminded time and time again that we are all in this together. Difficult situations also highlight for us the inescapable truth: our time here is precious and fleeting. We all take turns being in the frontline of disaster, of loss, in acute pain and stress and, we also have our turn in being free from acute stress and danger. Unfortunately, sometimes when stress arises we withhold our love and care from self and others. We hold ourselves back from life’s joys and kindness when they are obscured by suffering and we are in a survival mode. We forget to reach out and hold ourselves separate; maybe holding on to judgement and criticism of self, situation or others. We can be loving instead if we could only remember it’s available to us. Difficulties and societal upheavals bring us closer together as we experience our fragility and loss. This time of year in the Jewish calendar we review and reclaim our humanity: our belonging and sharing in the human tribe. It gives us an opportunity to contemplate how we belong and how we hold ourselves apart. For so many of us, with our lists of “should” and culture telling us we need to deny our authentic experience, we sometimes buy into a preconceived notion of what is right and should make us happy. We can lose our way even when we are together. Why are we focusing on the denial of our human experience? Why shame, judgement, guilt and anger? Why the withholding of love? What is in the way of feeling connected, cared for and caring? How can we relax a bit and trust ourselves and each other more? What do we need to release? And mostly, what do we need to forgive ourselves for? And what forgiveness can we extend to others? Tashlich is a ritual of release that we participate in during Rosh Hashanah (the Jewish New Year September 10th.) I want to offer this practice of release to use during the days leading to the Jewish New Year. It can also be used anytime of year to help you release. Tashlich is traditionally done with breadcrumbs that are cast into a natural body of water. I am offering a variation on it here with imaginary or real rocks, pebbles, or other natural materials. Imagine you are holding a stone in your hand, or actually holding one, and bring it close to your heart. Feel it as a heaviness in your emotional heart, a burden you are carrying in your chest, painful feelings or a belief. What burdens are you carrying in your heart? 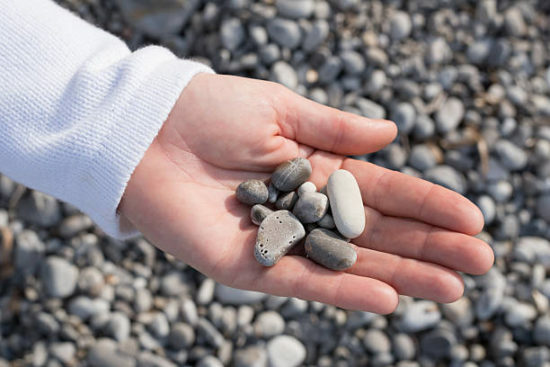 The rock in your hand can be something which is hard for you to let go of, something you want or need to release. This hand gesture symbolizes your willingness to release and ask for help. You are willing to stop carrying the worry, the secret, the shame and give it up to make room for the joys of life. Give attention to and notice what you are holding and how you are holding back within yourself and in your life. What has hardened and closed your heart? What have you been feeling shame about? How are you holding yourself separate? 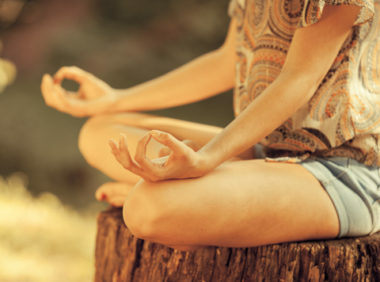 Notice your breathing and relax with the closed fist by your chest until it is clear what you are holding. Begin opening your hand and prepare to release it when you are ready. Toss it, send it with kindness and care into the river of life and feel the effect of the release. Feel how the stones you release return to the river of life and find their place washed anew and cleansed. Be gentle and go slow. It may bring up unpleasant (or pleasant) feelings that are hard to face or hard to let go. You may want to grab them back or hold onto them. One by one, repeat as many times as you wish, until you feel it is working. All the things that need to be released at this time are forgiven and set free. Interested in joining Sigal for the fall Jewish holidays? Click here to view schedule, or download her free online meditations here. Sigal Brier is a rabbi, inspirational teacher and a personal mentor. A yogini for over 30 years, she is trained in psychology, art, religion, meditation, holistic and psycho-spiritual modalities. She is the creator of MENDFUL - the healing mindset. She teaches internationally; facilitating experiences of transformation for individuals and groups. She has presented at TED and on faculty at Kripalu Center for Yoga and Health in MA. She was featured on CBS Sunday Morning news and NPR: National Public Radio. She dedicates her life to sharing methods and inspiring people to live their heart’s purpose; living authentically, mendfully and joyfully. Find out more at Rabbisigal.com.